Elevate the moment with a gorgeous holiday charcuterie board. This simple yet elegant holiday charcuterie board is easy to assemble and will have your guests coming back for more. 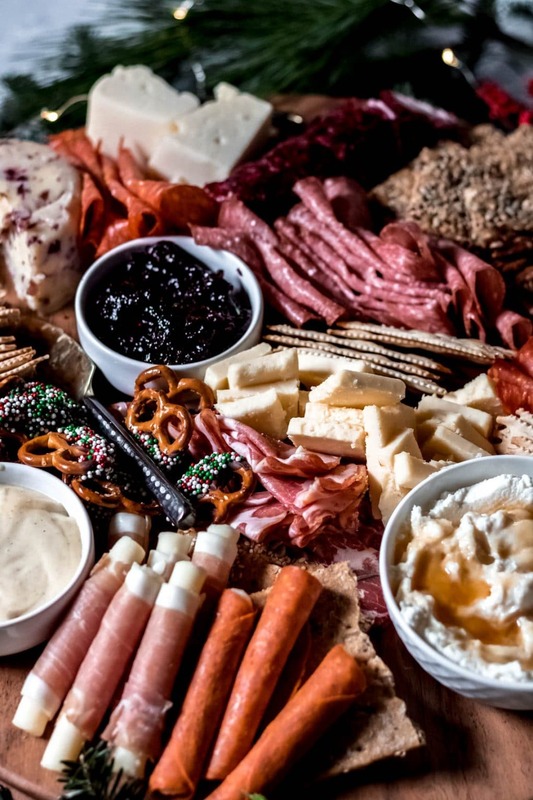 Also more casually referred to as a meat and cheese board, a charcuterie board, (pronounced shahr-cute-uh-ree), is essentially an assortment of cured meats that are paired with various accompaniments such as cheese, fruit, bread, crackers, and sauces. There’s no right or wrong way to create a charcuterie board, but we’ll talk about some tips below to help you create your own masterpiece. The best part of creating a gorgeous holiday charcuterie board is that it’s a blank canvas! I think that’s why I love building charcuterie boards so much; it allows me to tap into my creative side. 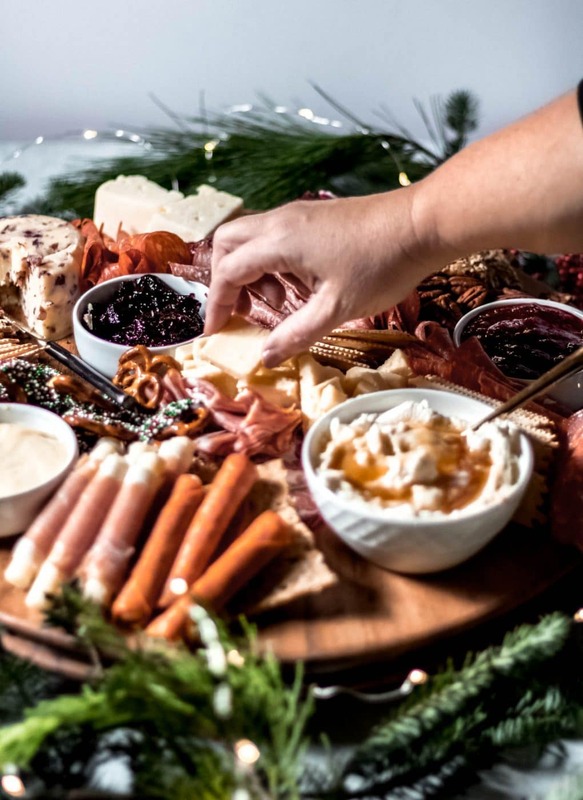 There are a few tips to help you build a holiday charcuterie board that will be a gorgeous centerpiece your guests will love. Create a balance between flavors and textures. You can achieve this by having a mix of hard and soft cheeses, sweet snacks and spicy spreads, and fresh fruit with salty nuts. These are just a few examples to help get you started. With it being a holiday charcuterie board, add in extra holiday pieces like chocolate covered pretzels, candied nuts, and cranberry sauce. Strike a balance with color if you can. Mix colorful fruit with neutral pieces like slices of bread and crackers. Add in seasonal garnishes around your board such as greens, sugared cranberries, or sprigs of fresh rosemary. Additionally, you can find great wooden boards to use as the foundation for your charcuterie board at places like Home Goods or World Market. During the holiday season is a great place to find a wide selection of boards. 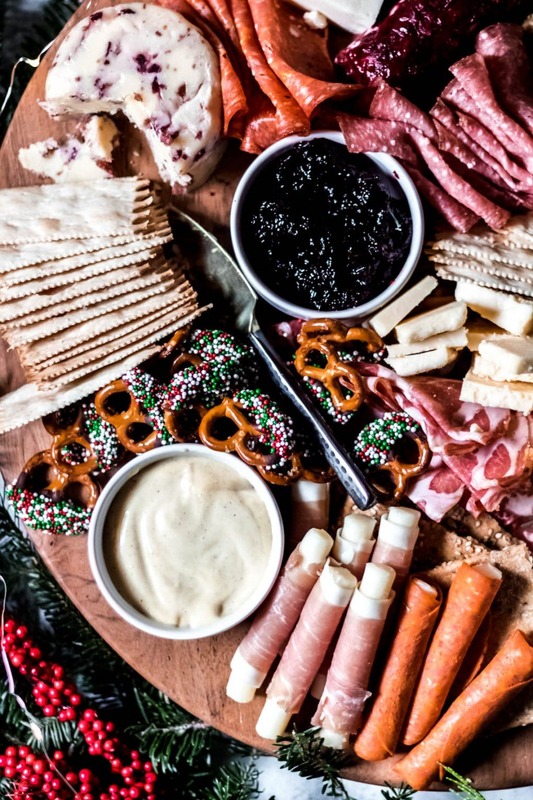 How much food should I buy for my holiday charcuterie board? 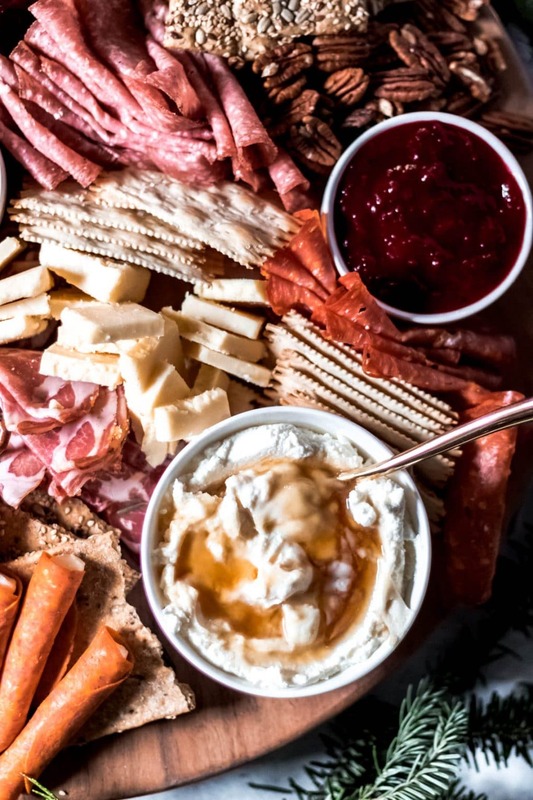 Keep in mind that your holiday charcuterie board should most likely be a small plate appetizer for your guests. Plan for around 3-4 slices of meat per person and about 1-2 ounces of cheese per person. From there, you can add in fillers such as bread, crackers, nuts, fruit, and other accompaniments to help fill your guests’ appetite. Serving a variety of cheeses with your holiday charcuterie board is ideal. A mix of soft, semi-hard, and hard cheese will pair best with your various cured meats. In addition to texture, be mindful of pairing mild and strong flavored cheese as well. For a holiday charcuterie board, this is a great time to grab specialty cheese that is around just for the holiday. Aldi is a great place to find seasonal cheese. 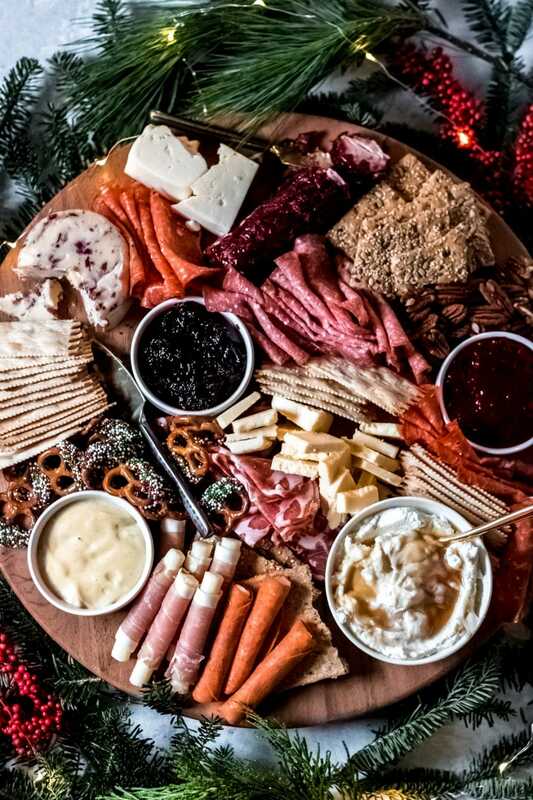 On this holiday charcuterie board pictured, there are specialty cheeses such as champagne cheddar, white cranberry cheddar, and cranberry cinnamon goat cheese, just to name a few. These make great items for your holiday charcuterie board. The possibilities for building a simple yet elegant holiday charcuterie board are endless! 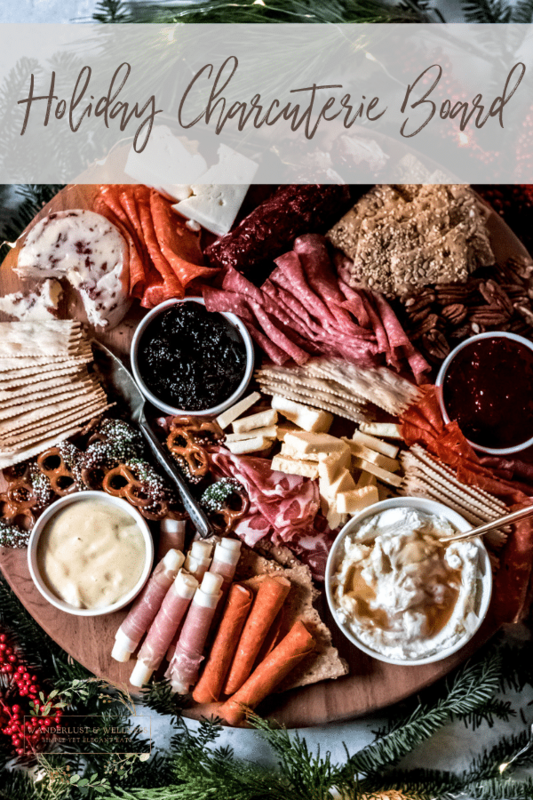 Be sure to snap a picture of your own holiday charcuterie board and share on social media; be sure to tag #wanderlustandwellness in your photo, too!